To prove a Royal Descent, one needs to prove every single step. It is often hard or impossible for researchers to be experts in each family at each step in the chain. As a result, Royal Descents are often proposed only to fail later when one step in the chain is discovered to have problems. Here is a collection of unproved or claimed or disproved Royal Descents of famous people. For the list of ones that are proved (or at least, not yet disputed) see Royal Descents of famous people - The List. This list collects errors and problems that occur across multiple attempted descents, as opposed to ones found in only one attempted descent. Alsop line - John Alsop and Temperance Gilbert are not the parents of Joseph Alsop who married Elizabeth Preston. Baynton-Echingham-Fitzalan line - The attempted descent of Joan Echingham (wife of John Baynton) from John FitzAlan and Eleanor Maltravers is wrong. See discussion on soc.genealogy.medieval. Beke/Stafford line - The wife of Nicholas Beke is said to be Joan Stafford, dau of Ralph de Stafford, 1st Earl of Stafford - however by his 1st wife, not his 2nd wife. And even this is not certain. See discussion. Bowen line - Richard Bowen (who married Ann Borne) was not the son of James Bowen and Ellen Griffith. Browne/Leids line - Edward Browne who married Jane Leids was apparently son of William Browne and Magdeline Elsick, not of Thomas Brown and Dorothy Beauchamp. See also here. de Chatillon line - Beatrix de Chatillon is not dau of Marie de Bretagne. She does not descend from Henry III, but does descend from Stephen. Dudley line - William Dudley is son of William Dudley and Ellen/Eleanor, not David Dudley and Joanna Arnold. Fiennes line - Richard Londenoys' wife is claimed to be a Catherine Fiennes, dau of Thomas Fiennes, 8th Baron Dacre. But there is no evidence for this. See discussion. Gaveston line - Piers Gaveston, 1st Earl of Cornwall apparently had a dau Amie (or Amy) Gaveston, but she is a natural dau and is NOT a dau of his wife Margaret de Clare. Greene/Mallory line - Ala Mallory who married Thomas Greene was apparently sister, not daughter, of Anketil Mallory who married Alice de Driby. Hoar/Lisle line - Alice Lisle (wife of John Hoare) is apparently not dau of John Lisle and Alicia Beconsawe. Holand line - Elizabeth Holand is not the dau of John Holland, 1st Duke of Exeter. See notes by Ed Mann. See 2001 post by Douglas Richardson. Mallory line - Margaret (surname unknown) who married Robert Corbet was apparently not the daughter of William Mallory. Rather he was her 2nd husband. 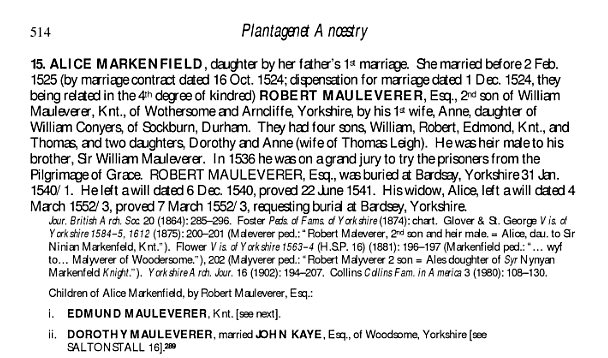 Robert Mauleverer line - [Richardson, 2004, p.499] had Robert Mauleverer as son of William Mauleverer and Jane Conyers, dau of John Conyers and Alice Neville. But [Richardson, 2011] changes this, and has him as son of William Mauleverer and Anne Conyers, dau of William Conyers and Anne Bigod. We take this as the correct line. See extract from Page 514 of [Richardson, 2011]. Morgan line - It is not proved that James Morgan who married Martha (Margery) Hills is son of William Morgan and Elizabeth Morgan. Southworth line - It is not proved that Edward Southworth is son of Thomas Southworth. See p.14 of Ancestral Roots of Certain American Colonists. See [Roberts, 2008, pp.308-309]. See post by Deborah Southworth Sweet. 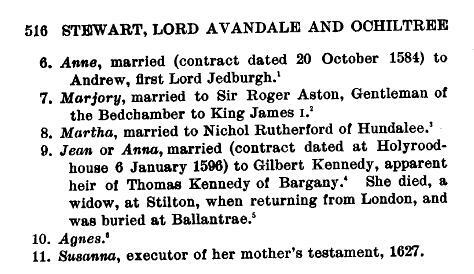 Stafford line - Anne Stafford (wife of William Berkeley) is dau of Humphrey Stafford and Eleanor Aylesbury not Humphrey Stafford and Margaret Beaufort. Street/Poole/Pole line - The claimed descent of Ann Poole (wife of Nicholas Street) from William Pole and Katherine Popham is disputed. Welles line - Anne Welles (wife of James Butler) is dau of 4th Baron Welles not 5th. See summary of what US Presidents have proven Royal Descents. There are unproven claims that more US Presidents have Royal Descents. Brooks-Baker claimed Royal Descents for many US Presidents, without proper proof. His claims would mean 34 out of the first 43 have Royal Descents. He proposed the Most royal candidate theory - the theory that the "most Royal" US presidential candidate always won. This theory seems disproved by many elections. BridgeAnne d'Avignon claims 42 out of the first 43 Presidents have Royal Descents (all Presidents except Van Buren). But no proof is given. US Presidents - Claims that 43 out of the first 43 Presidents have Royal Descents. And shows the claimed descents. But some of them seem incredible. We know that JFK descends from the Kennedys, small Catholic tenant farmers in Ireland in the 18th century. However Dowling claims these descend directly from Gilbert Kennedy, an alleged son of Gilbert Kennedy, 4th Earl of Cassilis (died 1576). This seems incredible, and no proof is given. CASSILIS in [Scots Peerage, vol.2] shows the 4th Earl with no such son. OCHILTREE in [Scots Peerage, vol.6] shows the reference as being to a different Gilbert Kennedy altogether. Not that there is proof of a connection from the Irish family to that Gilbert Kennedy. See discussion. John Adams, born 1735, US President. See attempted descent from Edward I by Ed Mann. This fails on the Browne/Leids line. Andrew Jackson, born 1767, US President. He may descend from Edward I.
Ursula Hildyard is said to be a descendant (through Hastings, Morley and de la Pole) of Hugh de Stafford, 2nd Earl of Stafford, descendant of Edward I.
Zachary Taylor, born 1784, US President. See descent from Edward III through William Strother by Ed Mann. [Roberts, 1995] says the Strother descent is unproved. [Roberts, 1995] says there is another possible but unproved descent from Edward I through Anthony Savage. James Buchanan, born 1791, US President. There is a claimed descent of James Buchanan from Henry I, shown in [Burkes Presidential]. See here. However [Roberts, 2008] says this descent is possible but unproven. Abraham Lincoln, born 1809, US President. The descent of Abraham Lincoln from Edward I shown in [Burkes Presidential] is not accepted. The parentage of Nancy Hanks (also here) is disputed. Ulysses S. Grant, born 1822, US President. This attempted descent from Edward III by Ed Mann fails because the parentage of Walter Palmer is wrong. Elizabeth Verney (died 1592) did not marry John Palmer and did not have a son Walter. Walter Palmer's parents are uncertain. See Larry Chesebro site here and here. See Walter Palmer Society here and here. The descent of Ulysses S. Grant through Booth from Henry II shown in [Burkes Presidential] and here and here and here was disproved by Donald Lines Jacobus in The American Genealogist 37: 77-79. There was a claimed descent from Edward III through Clement Miner (born 1585), who was claimed to be the grandson of John de la Pole (died 1491) and Elizabeth Plantagenet. See summary. But the dates are impossible. This descent was proven false in the New England Historical and Genealogical Register around 1990. See here. Stonewall Jackson, born 1824, Confederate general in American Civil War. [Burkes Presidential] shows a descent from Henry I, King of France. However, Gary Boyd Roberts does not include him among Presidents with Royal descents. Bob Dole, born 1923, US Presidential candidate. The unreliable Harold Brooks-Baker claimed that Bob Dole had a descent from Henry III. Colin Powell, born 1937, US Secretary of State. William Addams Reitwiesner summarises the claim. Colin Powell claims his mother Maud Arial McKoy, born 1901, is descended from Sir Eyre Coote, born 1760, who descends from Edward III. No proof is given. Bill Clinton, born 1946, US President. The unreliable Harold Brooks-Baker claimed that Bill Clinton had a descent from King John. Oliver Cromwell, born 1599, Lord Protector of England, Scotland, and Ireland. (todo) see: "Oliver Cromwell's Stuart Descent", The Genealogists' Magazine, 3(1), Mar 1927. Daniel Boone, born 1734, pioneer explorer of the American West. "The Family of Edward Morgan of Pennsylvania: Daniel Boone's Maternal Kin" [part 1], Stewart Baldwin, The Genealogist, Vol. 15, No. 1 (Spring 2001): 104-28. "The Family of Edward Morgan of Pennsylvania: Daniel Boone's Maternal Kin" [part 2], Stewart Baldwin, The Genealogist, Vol. 15, No. 2 (Fall 2001): 172-95. Cecil B. DeMille, born 1881, film director. Gary Boyd Roberts shows a Royal Descent: "CECIL BLOUNT DEMILLE, 1881-1959 (Constance Adams; Frederic Adams & Ella King; Frederic Augustus Adams ..."
At first glance, this looks like a Royal Descent for DeMille. But confusingly, he is showing a Royal Descent for DeMille's wife. Margaret Mead, born 1901, anthropologist. Sir Laurence Olivier, born 1907, actor. The descent of Sir Laurence Olivier from Charles II as shown at the Thomas Arundell Society (see here) is wrong. Emma Eden married Rev. Dacres Olivier, grand-uncle of Laurence Olivier. i.e. She is not an ancestor, or even a blood relation. See OLIVIER in [Burkes Peerage, 1938]. Tennessee Williams, born 1911, playwright. This attempted descent from Edward III by Olivier Guionneau fails. Mary Johnson who married Samuel Ayer was not the daughter of Humphrey Johnson and Eleanor Cheney but of Peter Johnson and Ruth Moulton. This attempted descent from Edward I by George Larson fails on the Alsop line. Tennessee Williams is claimed to descend from Percival Lowell (born 1571), and hence from Edward I. Bill Gore, born 1912, founder of Gore-Tex. Donald Maclean, born 1913, Soviet spy. The attempted descent of Maclean the spy from Charles II is wrong. Maclean the spy is son of the politician Donald Maclean (born 1864, died 1932) who married 2 Oct 1907 to Gwendolen Devitt. This was formerly confused with Donald Charles Hugh Maclean (born 1876, died 1909) who married 26 Oct 1907 to Gwendoline Hope, descendant of Charles II. This is a totally different couple. See Hope under LINLITHGOW in [Burkes Peerage]. See descent of Rupert Everett. Roger Sperry, born 1913, neuroscientist. See attempted descent from Edward III by George Larson. See problem with Street/Poole/Pole line. Willard Boyle, born 1924, physicist. See attempted descent from Edward III by George Larson. However this fails on the Hoar/Lisle line. Clint Eastwood, born 1930, actor and director. This attempted descent from Edward III by Ed Mann fails on the Morgan line. Gary Boyd Roberts says Clint Eastwood may have a descent from Henry I.
Quincy Jones, born 1933, record producer. This attempted descent from Edward I by George Larson fails because Richard Washington is not the son of John Washington and Anne Pope but rather the son of a different John Washington. See The William and Mary Quarterly, January 1, 1915. Also here. Ancestry was featured on program African American Lives in 2006. Elvis Presley, born 1935, singer. See descent from King John by Axel Schmidt. See descent from King John by Ray Anderson. Kathy and Larry McCurdy give the ancestry of Elizabeth Wright who married Isaiah Harrison. The Tunis Hood Family (1960) shows their grandchild was Elizabeth Harrison, wife of Tunis Hood. William Addams Reitwiesner shows descent from Teunis Hood and Elizabeth Harrison to Elvis. David Carradine, born 1936, actor. Leo van de Pas says the descent from Edward I is now disproved. Margaret Atwood, born 1939, writer. This attempted descent from Edward III by George Larson fails. See discussion of the Converse line in "The Road to Royalty is Broken" by Robert J. Kurtz, 1998. Sam Waterston, born 1940, actor. This attempted descent from Edward I by Ed Mann fails. Richard Tilden who married Elizabeth Glover was nephew, not son, of Richard Tylden who married Joan Legh. Richard Palgrave, father of Anna Woodbury was not Dr. Richard Palgrave, son of Rev. Edward Palgrave. Michael Moore, born 1954, left-wing filmmaker. See attempted descent from Edward I by George Larson. This fails on the Dudley line. It also fails on the Gaveston line. Andie MacDowell, born 1958, actress. Kevin Bacon, born 1958, actor. This attempted descent by George Larson fails on the Hoar/Lisle line and the Stafford line. This attempted descent from King John by George Larson is disputed. See Royce genealogy by Lynn Harris Eggleston. See Appleton genealogy by Jeffrey Hause. Laura Dern, born 1967, actress. As do these descents by Ed Mann. Also, Jean Macleish was not daughter of Norman MacLeish, but rather of Norman's half-brother Bruce MacLeish (whose mother was Louise Little). Ethan Hawke, born 1970, actor. See attempted descent from Edward I by George Larson. See more attempted descents from Edward I by Ed Mann. However all these descents fail on the Hoar/Lisle line. Seth MacFarlane, born 1973, creator of Family Guy. See first and second attempted descents from Edward III by George Larson. See attempted descent by Ed Mann. These all fail because they have Mary Ellis as dau of Joseph Ellis and his wife Hannah. Page 88 of The genealogical history of Dover, Massachusetts (1917) says Mary Ellis is dau of Eleazer Ellis and Mary Crosby. A further problem is the Hoar/Lisle line and the Stafford line. This attempted descent from Edward I by George Larson fails because Elizabeth Alsop, wife of Bryan Rossiter, is dau of John Alsop of Somersetshire but he is a different person from John Alsop of Derbyshire who married Temperance Gilbert. Rashida Jones, born 1976, actress. Ancestry featured on program Who Do You Think You Are? in 2012. Joseph P. Kennedy III, born 1980, US Congressman, grandson of RFK. Kelly Clarkson, born 1982, singer. Kate Bosworth, born 1983, actress. The famous Yeats family descended from a John Butler of Dublin. They believed he descended from Edmund Butler, ancestor of Butler of Newchome, Co.Kilkenny, and descendant of Earls of Ormonde and of Edward I. The Yeats family used the name Butler Yeats as a result. But no one ever proved the descent. W.B. Yeats himself worked on this link but never managed to prove it. William M.Murphy, The Yeats Family and the Pollexfens of Sligo, 1970. Joseph Hone, William Butler Yeats, 1962. A. Norman Jeffares, William Butler Yeats: Man and Poet, 1962.